The wintertime blues can leave us with a lack of motivation to get things done on our homes. That is why many people consider doing their home renovations during the spring/summer when the weather is nice out. However, during those seasons contractors have very hectic schedules. There may be a chance for you to get on their schedules early but if not, it may be hard to squeeze you in. By scheduling projects for the winter months, you are putting yourself ahead of the spring renovation crowd. So, it is best to plan ahead! There are multiple reasons to remodel your home during the winter. The first is that the contractors and their trade partners have much more flexibility in their schedules, allowing them to make sure that your project is done efficiently and in a timely manner. Unlike the summer, kids are in school and most adults are on their normal work schedule, making it less disruptive to have work being done inside your home. This will help the contractors move a bit faster in completing your project. As the seasons change, the effects of supply and demand also come into play. Materials are unlikely to see a price increase ( as they often do during the spring/summer seasons) due to lower demand. If you are looking at a kitchen remodel, it is a good time to buy new appliances. Manufacturers roll out their new models in the fall and holiday sales mean it’s the perfect time to buy and increase savings. 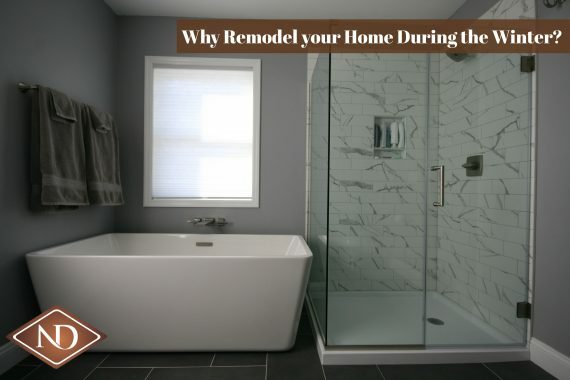 There is never a bad time to renovate your home but doing it during these months will ensure the project gets done on your schedule. Depending on the size of the project the planning alone could possibly take a month or two, especially if an architect is required, in order for the design to be completed for pricing. Once the process of design and pricing are completed, you can begin your remodel. If you plan during the fall and act in the winter, it will allow you to enjoy your finished project during th espring and summer. Now is a good time to look at your home and begin the planning process. If you are considering a project, New Dimension Construction would be pleased to discuss our process with you. Call (845) 605 – 1313 or email info@NDCcontracting.com . We think you will find this approach refreshing!